We have a new horse, a 6 year old Arab. He's still in the learning and conditioning phase. He's coming along well. At the Strawberry Fields Endurance Ride, he completed 25 mile events two days in a row, no problem. He'll be ready for 50 mile events soon. He's a tall boy, so he'll be Steve's ride. Sugar also completed 25's at Strawberry. She loves to go, and she's already proven she can do 50 mile events. While training on a mountain near home, we saw this rare white bitterroot. There were only a few of them in a big meadow at about 8000 feet. In the early spring, we saw a lot of Balsamroot, with their bright yellow flowers. 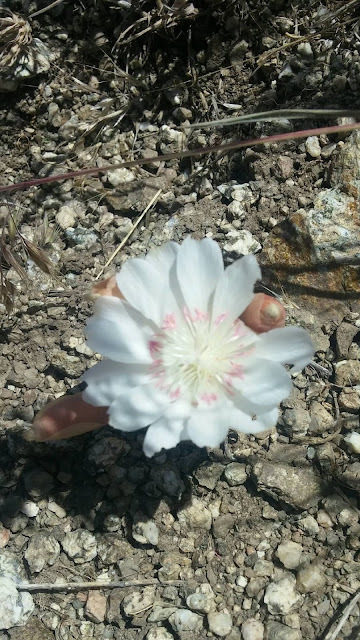 A week ago, Zazo discovered chicory in bloom. He liked it. On the Yellow Fork trail, an animal hid in the brush. Can you spot her? On a trail near Woodland, Utah, we found the world's most pitiful excuse for a gate, shown above. The feed bags are supposed to be a warning that wire is present, I presume. The yellow sign says "Please close the gate". The word "gate" must be someone's idea of a joke. The mountains north of Strawberry Reservoir are at their wildflower peak in late July. We took a lot of photos there. With Zazo coming on board, we had to find places for Boss and Coco, who are both in the 18 to 20 year range, a little old for endurance, but still a good age for 4-H or general trail riding. Fortunately, we were able to find good homes for both of them. Mischief is 27 now and doing great for his age. We hope he'll be giving rides to the grandchildren for many years to come. Much of the hiking in the Wasatch Mountains is a challenge for kids, but we've found a few hikes in the foothills that are short enough to be fun for young children. From the Rocky Mouth trailhead, a trail follows a gentle stream to a waterfall. The walk is mostly shaded, so it's acceptable even in hot weather. The hike to Big Spring, up Provo Canyon, has pretty views. The wildflowers were blooming along a stream in late June. Another short hike is up Ferguson Canyon. This is an area where our boys did a lot of rock climbing in their teenage years. The big attraction for the little kids was the Rainbow Tree. There's no rainbow color, but the shape is right and the kids were impressed. After a rainstorm, this real rainbow dressed up the mountain in front of our house. We recently complete a 50 mile endurance competition starting at Mt. Carmel Junction and traversing the countryside surrounding Zion National Park. The above photo is taken at Mineral Point, above a branch of the Virgin River. Also in April, we traveled to canyon country just outside of Bryce National Park, riding trails through Casto and Losee Canyons. The reddish hoodoos are typical of the area's famous Claron formation. Note the tiny window in the red rock fin. This streambed showed an abundance of small pockets created by erosion. We found running water in one canyon, enough to provide a cool drink for the horses and a swimming hole for Daisy. In front and to the left of Steve is a Great Basin bristlecone pine, Pinus longaeva. At this latitude, we see them at 8000 feet or above, in high, windy, dry locations subject to cold winters, where they are best able to compete. Bristlecones grow very slowly and some are estimated to be thousands of years old. The needles can stay on the trees for up to 40 years. The thickly needled branches resemble bottle brushes. The tree seems to prefer the dolomitic white colored soil shown above. Limber pine and Ponderosa pine also grow in the higher areas. The weather was 60ish and sunny, with just enough wind to keep the horses cool. We couldn't have ordered up a better day to explore these colorful, unique canyons.